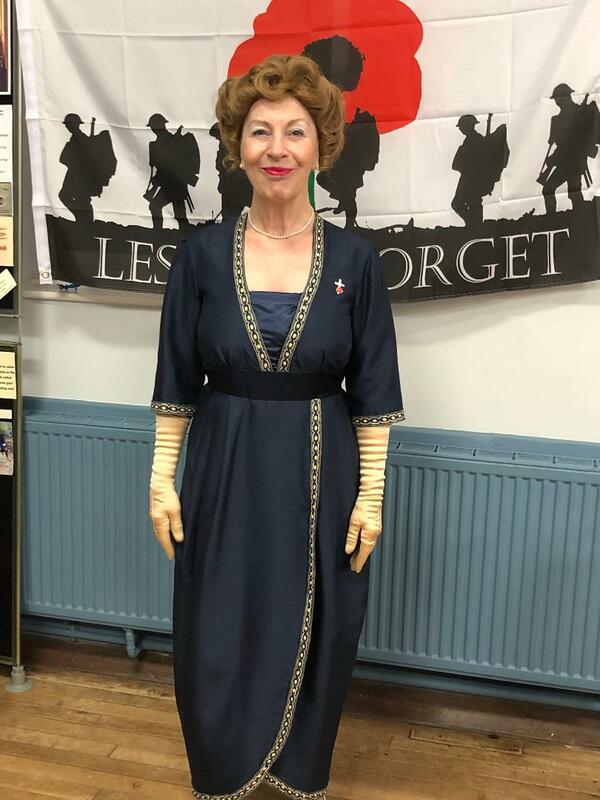 I was delighted to be able to dress up in costume and encourage everyone to sing along with me at the recent commemoration events which took place in Stamford Bridge and Sutton-Upon-Derwent throughout the weekend of the 10th and 11th November 2018. It has been inspirational watching how communities across the country have united to commemorate the millions of people and animals who gave their lives in service of our country during the First World War atrocities. Although commemorating some very dark and difficult times in our past, such commemorations are right up my street as I particularly love the music from the Music Hall, WWI and WW2 eras and the opportunity to encourage audiences to sing along and have some fun at the same time. Music is such a tonic. This video captures a few of the songs that I sang during the “Stamford Bridge Remembers” event on Saturday 10th November, in the lovely Village Hall at Stamford Bridge, York and demonstrates some of the tremendous work carried out by their community in commemoration of the eleven local men who lost their lives during WW1. I am delighted to have been asked to lead the sing along session of WWI songs at Stamford Bridge’s special celebrations to commemorate 100 years since the end of WWI, 100 years of the RAF and 100 years of the Suffragettes. 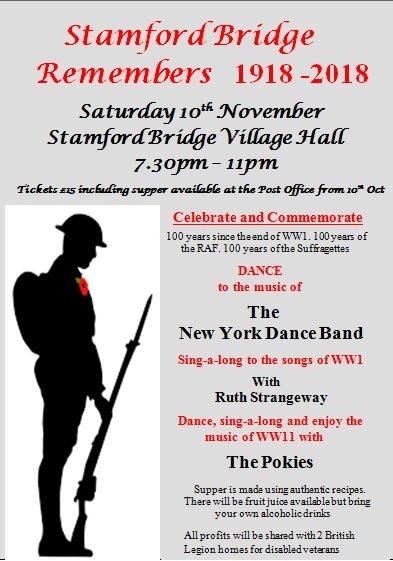 The event will take place on Saturday 10th November 2018 in the Stamford Bridge Village Hall. It promises to be a great evening with music from The New York Dance Band and further entertainment from The Pokies. Tickets go on sale on 10th October from The Post Office, Stamford Bridge. Proceeds from the event will be donated to two British Legion homes for disabled veterans. Wendy Mitchell’s ground breaking book documents her personal experience of living with the early stages of Alzheimer’s. Diagnosed at 58 with its’ early onset, Wendy’s honest account and her many radio and TV appearances are helping to build a better understanding of the illness. “For so long, in this country, we havn’t talked about the complexity of the individual living with dementia. The ‘need’ for support and services has been ignored and thought of as the realm of charities and this is one of the main reasons for the chaotic state of social care at present. For so long people with dementia have been shoe horned into the general services which others believe is our need instead of individually assessing need. Now we’re beginning to rise in numbers and TALK in public, there’s a realisation of the individuality of ‘need’ – we don’t all ‘fit’ into current services provided. It’s almost as if it’s too late for all those of us currently living with dementia, both in the early mid and late stages and all stages in between. It feels like we’re the guinea pigs being used to try to sort out this mess so future generations can benefit. If everyone currently living with dementia, in whatever stage, has to be guinea pigs for change to happen, then so be it, but change there has to be. No more silence, no more voices of the few, no more talk and good intentions – there has to be actions. In the next 5 years huge social care change must take place so that in 10 years time, we’re proud of what the country has in place. People living with cancer aren’t shoe horned into inappropriate treatment, those recovering from a stroke aren’t shoe horned into inappropriate treatment….so why are people with dementia? Dementia lags behind in medical innovation so the need for social transformation is greater. We don’t have innovative medical procedures to follow or a plethora of choice on medication because research has been sadly underfunded so the need for social transformation is greater. In my mind this should naturally lead clinicians to use social prescribing instead of automatically looking at the medical model and then discharging us. No more silence and ‘making do’. We need to be realistic though and also examine various ways to fund this enormous need – what should and shouldn’t be funded – as we all know there is no infinite money in the pot. Yes it is a daunting job to transform social care, but then surely it was a daunting job to create the NHS in the first place, but it happened. Wouldn’t it be wonderful if social care was a job of choice, with recognition, status, and a value placed on the skills of the staff? Wouldn’t it be nice if individuals were treated as simply that, individuals with individual needs? Wouldn’t it be nice if policy makers actually listened to the people that mattered and had most knowledge? Well said Wendy. Come on you policy makers, it’s time to start catching up quick. A kind friend flagged up this wonderful video today from The Happiness Heroes demonstrating the many benefits to the elderly of raising small kittens. What a wonderful idea. “Ooh aah ooh aah” is the favourite expressions of one of the lovely gentleman in our group. 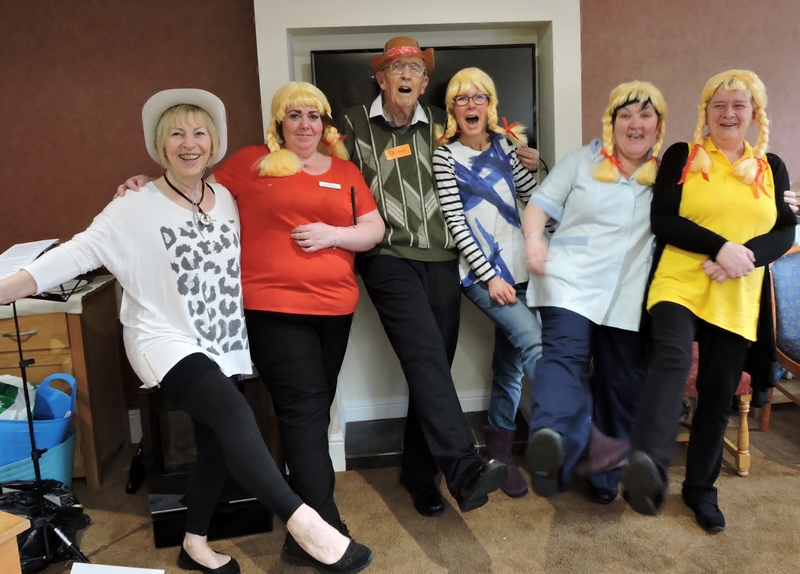 This week, his catchphrase prompted me to dig out some cowboy hats and blonde pig tail wigs from my dressing up box and get us all singing along to “I’ve Got A Brand New Combine Harvester” at our Music for the Mind” session. Well done everyone and thank you all for joining in the fun and getting dressed up. Our fortnightly sessions are all about expressing ourselves and creating some new memories in a fun, positive, caring and supportive environment. 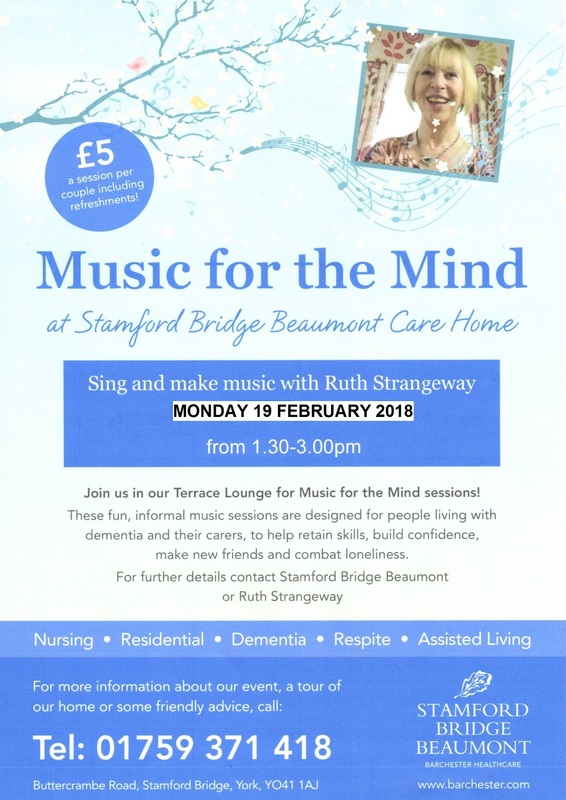 I’m looking forward to our Music for the Mind session next Monday on 19th February. Please forward to anyone you know living with dementia or who is looking after someone with the illness. Our sing along sessions are great fun and a good opportunity to make some new friends. Everyone is welcome. I was really excited to read the following BBC News item about a project called “Songs and Smiles” on line yesterday. In a care home in Walthamstow, north-east London, babies, toddlers and elderly residents are coming together to sing and play musical instruments together. “Songs and Smiles” is a “Together Project” founded by Louise Goulden, who whilst on maternity leave brought young and old together to help reduce loneliness and have a positive impact on those residents who have dementia. What a wonderful idea!